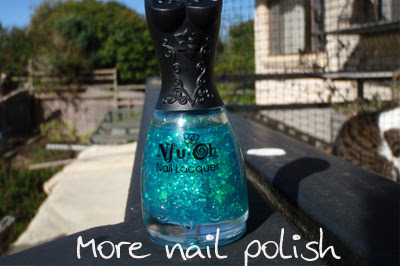 I nabbed some awesome Nfu Oh polishes for only $2 during the Vivid Nails clearance sale a month or two back. These are #123 and #124. This was two coats, but I could have got a better richness in colour if I had done three. 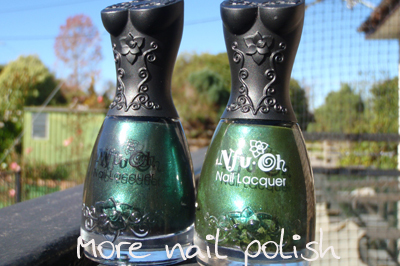 Here are the bottle pics, #123 on the left, #124 on the right. 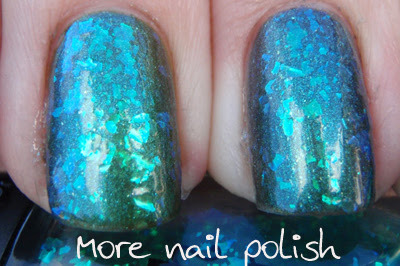 Then I thought I would try another polish layered over the top. This is #83. One coat of #83 over each of #123 on index and ring and #124 on middle and pinky. Up close to see the shimmer. I think this polish would franken into something darker very nicely. And for only $2 I'll happily try that out. Then I wanted to layer a bit more. So out came flaky #54. A coat of #54 layered over #83 over #123 on index and ring and #124 on middle and pinky. In the full sun. Same in the shade. 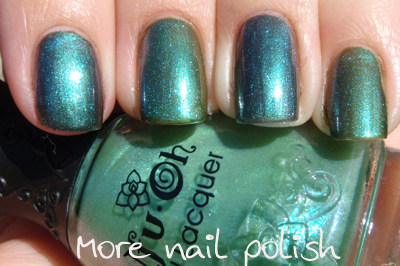 I think flaky polishes look way better indoors or in the shade, rather than full sun. So, with base coat, two coats of #123 or #124, then one of #83, then one of #54 the top coat = 6 coats. Excessive? maybe. Pretty? definitely. I also catch myself layering too much lol but this came out super cute such lovely greens and 2$ ugh where was I ? I'm not familiar with this brand at all but WOW are those beautiful! Wow, $2 is a real bargain! 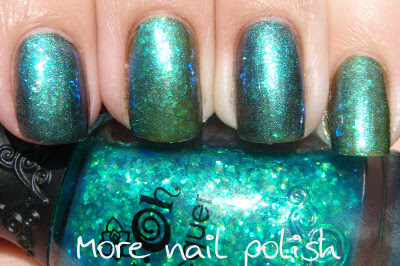 I really like nfu oh polishes, specially the flakies! 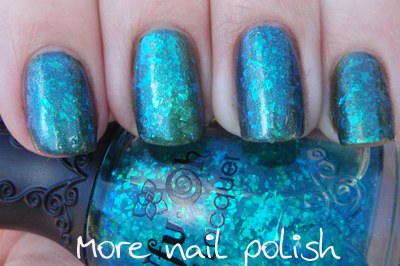 If you are wearing seche vite, 6 coats are not excessive! As long as they fully dry, that's the business! 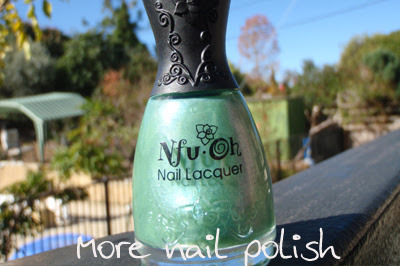 I love layering with Nfu Oh, the possibilities are endless :) What a great sale, 2$?! I would've bought them all LOL. This looks amazing no matter how many coats! Excellent layering. Dang that I missed out on that sale. Not when the results look this good.